What is it? 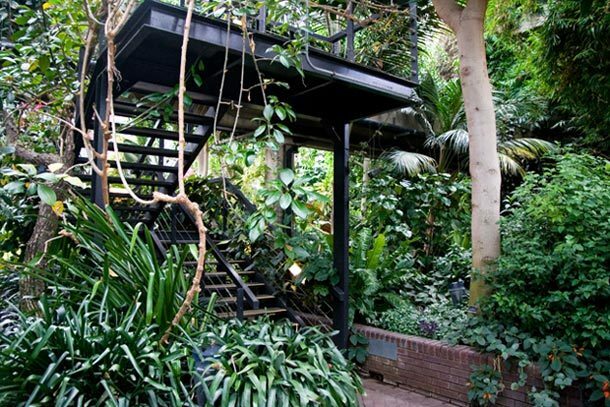 The Barbican Conservatory, a glass-covered green hideout in the heart of the City. Nature-ist's mission is to uncover the unconventional bits of wilderness that poke through London's rugged urban landscape. And a conservatory doesn't strictly count. But when we're talking the capital's second biggest conservatory after Kew, and a place that seems little known by most Londoners, then we thought we'd make an exception. Where is it? Er, the Barbican, surprisingly. Go up to Level 3, out the back doors, and turn right through the doors once you're in the courtyard. Can't miss it (though many have). Why has it tickled our fancy? It's a surreal slice of bucolic splendour located atop the Brutalism of the Barbican Centre. The conservatory is wrapped around the theatre's vast flytower, built specially large at the request of then-resident Royal Shakespeare Company. Mainly used for banqueting, conferences and private functions, the conservatory is open for free to plain ol' Joe Public on Sundays and bank holidays, from 12pm to 4pm. Nature notes: Some 2,000 species of tropical plantlife are arranged over the two levels, while cacti have a special climate-controlled room all by themselves. But we were particularly enthralled by the wildlife: terrapins bask on a rockery, while in the ponds, koi carp swim lethargically, perfectly capturing that relaxing Sunday afternoon vibe. Less impressive is the aviary, whose sad-looking birds are penned into a dismally small area.